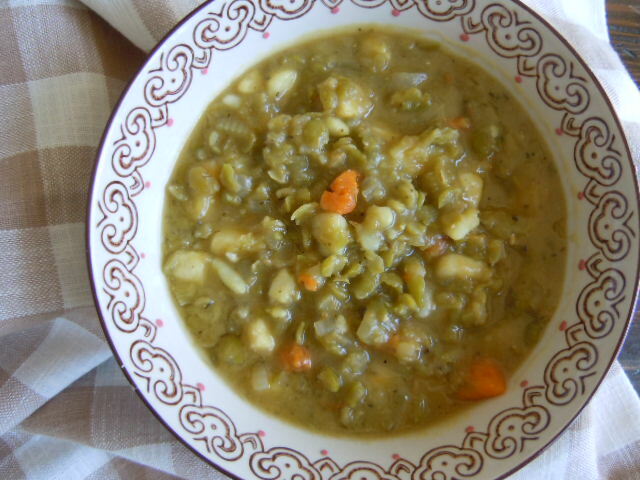 Split pea soup is one of my all time favorite soups! The addition of yams makes it even more special – the creaminess of the split peas is the perfect match with yams – who knew? This is a simple recipe that goes together quickly and split peas are a fairly fast cook as well. In just over an hour you can have dinner on the table! Make a side salad or serve it up with a thick slice of whole grain bread and dinner is served. The inspiration for this recipe comes from the The Health Promoting Cookbook by Alan Goldhamer. I had to adapt a few of my favorite ingredients from other split pea soup recipes and the results were so fantastic that I have made this soup twice! It’s on the menu again this week. This time I will be making a loaf of beer bread to go with it. Stay tuned for my veganized version of beer bread – its company approved! Although the yams in the soup photo look like regular potatoes they are actually a Japanese yam that is white inside – but it tastes like a regular yam. I bought them my mistake but we happen to really like them. Slow Cooker option – toss everything into your slow cooker – cook on high for 4 hours or low for 8 hours. Adjust cooking time according to how hot your slow cooker is. Mine runs super hot and things always cook way faster in it than what the recipes state. Just because I have a food blog it doesn’t mean that I always have motivation or creativity in the kitchen. Just like everyone else, there are times when I can’t think of what to fix for dinner! It’s so easy to get in a rut and keep making the same things week after week. To dig myself out of the rut I browse other food blogs as well as my own and I look through cookbooks. I just ordered some new whole foods plant based cookbooks from Amazon I can’t wait to read them (yes, I read cookbooks from front to back like they are novels) and choose some new recipes to try. I find that the change in seasons is also helpful. Fall foods like apples, squash and pumpkin are making their way onto our menu. I made some delicious chocolate chip pumpkin muffins with no dairy or eggs that we gobbled up! After browsing through the tried and true recipes here on my own blog, I chose several that are going on the menu soon, Spicy Pumpkin Butter, Pumpkin Apple Butter, Roasted Caramel Glazed Cinnamon Apples, Kale Broccoli Slaw, Kale Waldorf Salad , Oven Roasted Butternut Squash with Apples & Pecans– m-m-m-m- doesn’t that all sound delicious? Leave me a comment and let me know you were here! Do you ever get into a cooking rut? What do you do to get out of it? I love split pea soup and the addition of yams sounds wonderful. BTW, I made your slow cooker beef stew the other day, and it was fabulous. I don’t make meat dishes very often anymore, and hubby said he could eat that dish every day. Well, that won’t happen… 🙂 Anyway, I just wanted to let you know that we really enjoyed the dish. I actually love eating the same food again and again. But the boys get usually tired of the same dishes over and over pretty quickly, so I force myself to switch things up. Oh Andrea, I am so happy to know that your family enjoyed the stew. That is an old family favorite around here. Switching things up on the menu is good for us – that’s how we get a bigger variety of nutrients! My slow cooker runs hot too – drives me nuts – if I don’t have it really full it will actually start boiling! Yam is the same as sweet potato, right? When I saw the title of this post, I was sure you were going to be blogging about a recipe that I love . . . Chef Aj’s Split Pea soup that is made in a pressure cooker. Now I know where she got the inspiration from! Isn’t it wonderful!?! LOVE split pea soup! Never had it without ham though but I think this sounds really good. I think it’s also a funny play on the traditional soup with ham b/c yam rhymes with it, plus the chunks resemble it in a way! Too cool. Yes to all you said Veronica! I am the definition of cooking rut except not a rut for me – I just am fine with it.. 🙂 I love the sound of your fall recipes though – LOVE this season of smells & spices!!! This is getting made for dinner tonight. Bill isn’t feeling well and I think this will be an ultimate comfort food for him. Since I don’t particularly enjoy cooking, I don’t really get into ruts. My challenge is getting myself revved up to cook at all. Reading cooking blogs has really helped that and I’ve become much better since entering the world of blogs. Was wondering about your foot – you haven’t mentioned it lately and not done much hiking. Is everything o.k? We love vegan split pea soup in the fall/winter. My husband never tires of it, but the kids will only eat it once or twice and are done with it. We tend to eat more soups in the fall/winter. Split pea soup is great in the pressure cooker too! Thanks for sharing the recipe. Oh boy do I ever get into cooking ruts! I guess I just let them run their course…and hope for a quick recovery! Love the sounds of this soup!! On the soup list for this fall for sure! This looks delicious! Is a serving size 1 cup? Sorry I don’t remember the serving size. You can measure how many cups you get and then divide it into 10 servings. Happy cooking! I made this yesterday and it was wonderful. I am just learning to cook. Except for some cookies, I have never made anything. This was the first main dish I have ever tried. I took the pressure cooker route, followed the recipe to the letter and in just a few short minutes I had a delicious soup. Easy Peasy. Thank you for providing a great resource. That is so awesome that my recipe is your first attempt and it was successful! Thank you for taking the time to let me know. That makes me feel so good.